Urinary Bladder problems are common but often neglected. Overactive bladder (urgency of urination) affects about 10-15% of all adults while stress incontinence (urine leakage associated with activity or cough) is a common problem in women. Most patients suffer in silence partly because of a lack of information and more so because of associated social stigma. An entirely different group of patients are those suffering from congenital spinal abnormalities (such as spina bifida) or spinal injury. Inadequate treatment in these patients can be disastrous since there is risk of losing kidney function. Many are children and it’s heart-rending to see 2-3 such patients with avoidable kidney failure week after week. 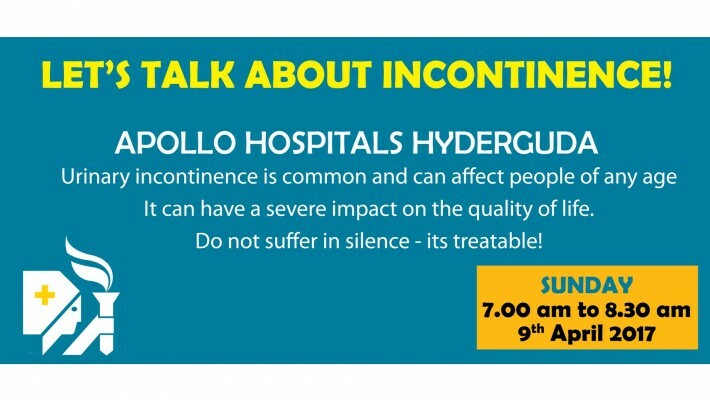 Apollo Hospital, Hyderguda is a tertiary referral center specialized in the treatment of bladder problems. We have been associated with several academic initiatives that have targeted professionals (urologists, pediatric surgeons, spine surgeons, gynecologists) involved in the treatment of these patients both in India and abroad, but this has clearly not been enough. With World Health Day around the corner, we are planning a public awareness program on 9th April, 2017 (Sunday) from 700-830AM. 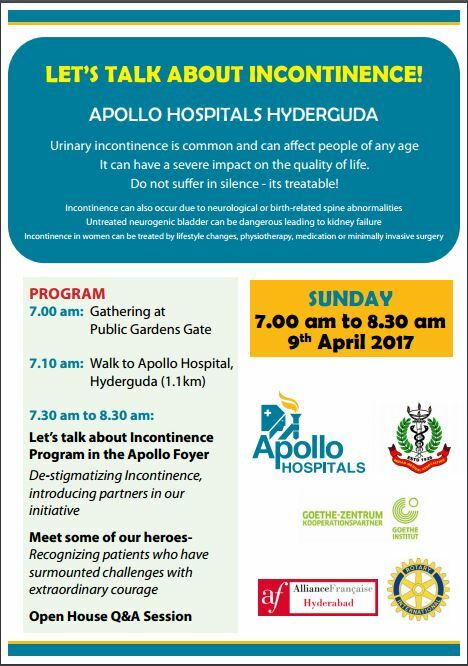 The program envisages assembly at Public Gardens Gate with a walk up to Apollo Hospital, Hyderguda where some of the heroic patients who have battled immense odds would be recognized. The exact details would be finalized shortly. Apollo Hospitals, Indian Medical Association, Rotary Club, Goethe Zentrum and Alliance Francaise, Hyderabad are all supporting the initiative and we expect support from the city administration. You can show your support by being a part of the program, talking about it, or just by spreading our message.